Organised tours often bypass the Shekhawati region in northwest Rajasthan, yet in the 18th and 19th centuries it was one of Rajasthan’s richest regions. 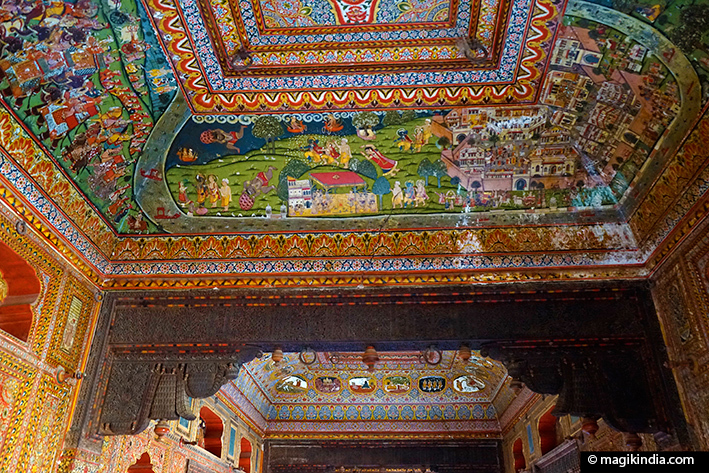 Wealthy Marwari merchants built huge mansions there, decorated inside and out with sumptuous frescoes in which Hindu mythology mingles with scenes from daily life. 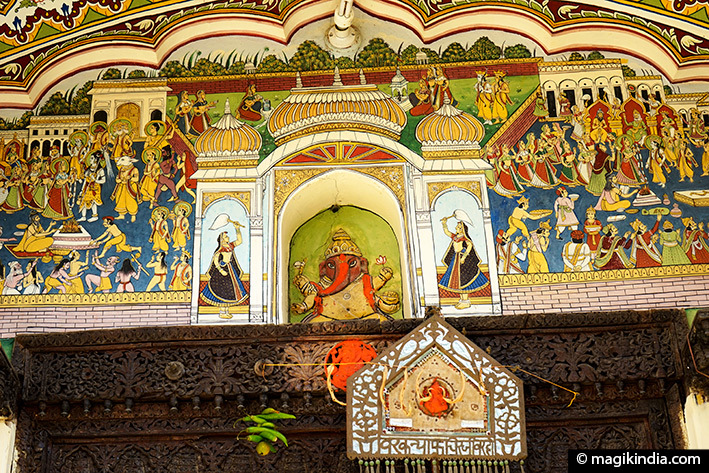 These masterpieces have earned the region a reputation as Rajasthan’s open-air art gallery. Shekhawati was an inhospitable sandy region where few crops would grow. But because the caravan trail passed through this arid land, in the 17th century merchants from Haryana and especially southern Rajasthan settled here. In the early 18th century the caravan routes between the imperial cities of Delhi and Agra and the ports of Gujarat shifted westward to avoid attack by the Maharastra troops, who were in rebellion against the Mughal Empire. The new routes, shorter and safer, passed through the Rajasthan region, where the merchants’ warehousing businesses boomed. But the rulers of Amber and Bikaner were short of money at the time and increased the taxes they levied from caravans passing through their territories. As a result, the cheapest and most-used goods route to the Arabian Sea was through Shekhawati. 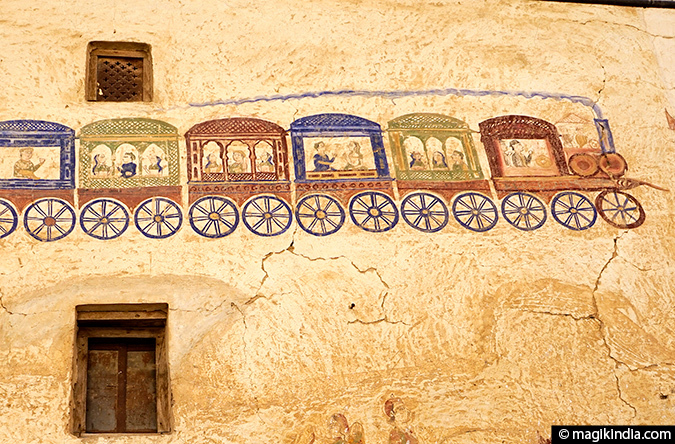 Shekhawati’s prosperity declined from the second half of the 19th century, under the British Raj, when the caravan route had to face competition from the new railways and maritime routes. As early as 1820 the Marwaris, who had already made their fortunes, began to move away to the great cities of India. Many settled in Calcutta, trading in jute and cotton. It was after the merchants left Shekhawati that they had magnificent mansions (havelis) built in the villages where their families were still living. In the mid-20th century these prosperous merchant families moved to India’s big towns, abandoning their stately homes. Many of these havelis are now in an advanced state of decay, although the Indian government has tried to raise awareness of the need to preserve them. World Heritage status would save these masterpieces and give the region’s tourist industry a fresh boost. 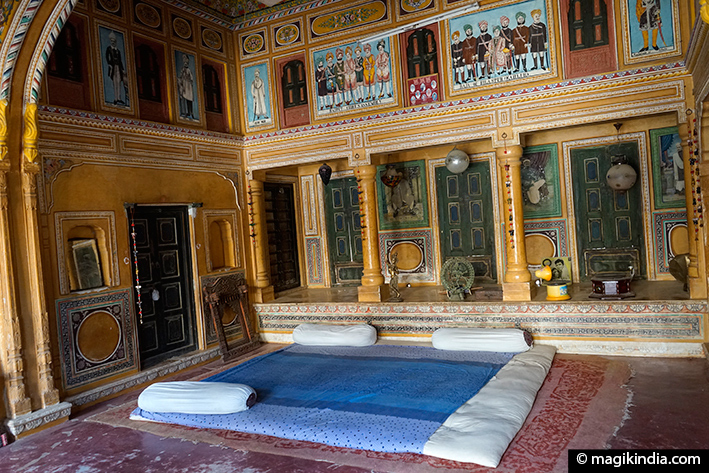 Apart from the beauty of the havelis, there is another pure gem in the Shekhawati region: Lohargal in the Aravalli hills. An absolute must-see! 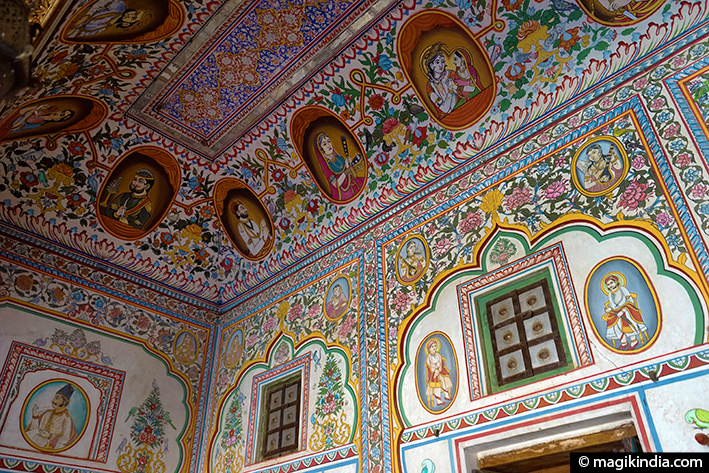 Shekhawati region is well known for its deep rooted culture and valuable heritage. In the month of february, this region celebrates Shekhawati Festival. This festival is jointly organized by the State department of tourism and the Morarka Foundation. The main functions of the festival are held at the Surya Mandal Stadium at Nawalgarh. Apart from that functions related to festival held in areas of Sikar, Jhunjhunu and Churu also. 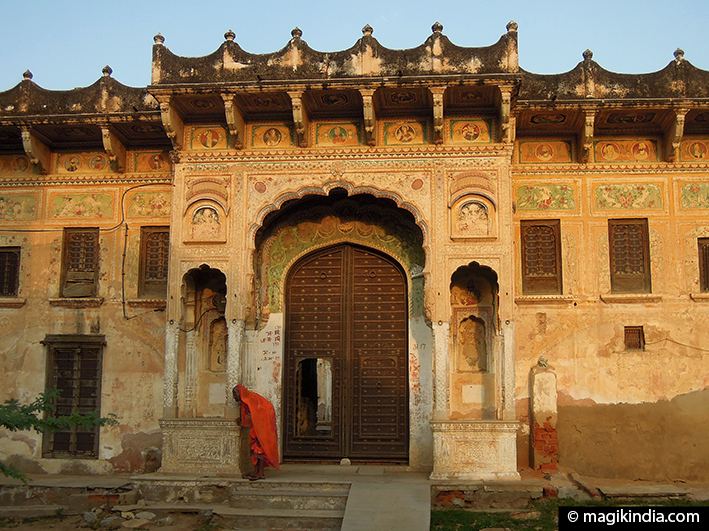 Fatehpur is a mandatory stop in the Shekhawati region, boasting many havelis.The best-known of Fatehpur’s havelis is the Nand Lal Devra Haveli, built in 1802 and recently restored by the French artist Nadine le Prince. Ms Le Prince, a descendant of the painter Jean-Baptiste Le Prince, completed the restoration in 1998. As the name suggests, it belonged to a certain Nandlal Devra. The Devras were a wealthy trading family who were also officers at the court of the local Maharaja. Nadine Le Prince has restored the entire palace and all its frescoes. 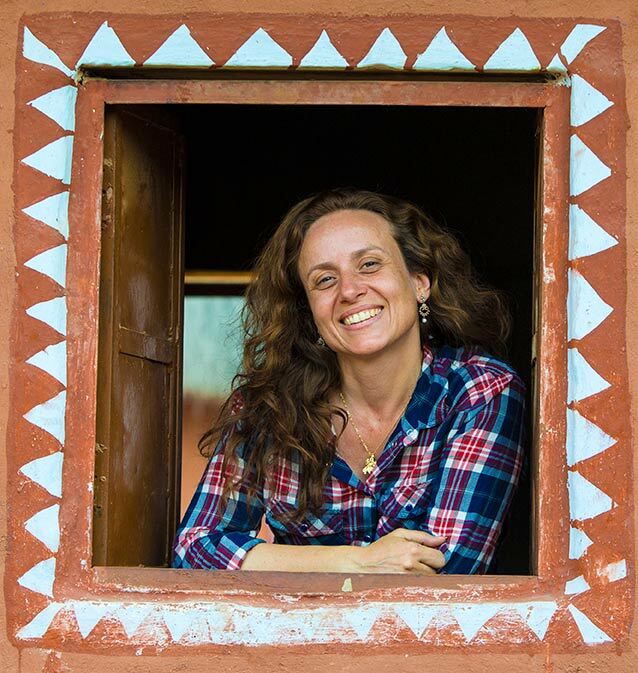 She also works to protect and restore the haveli heritage more broadly. 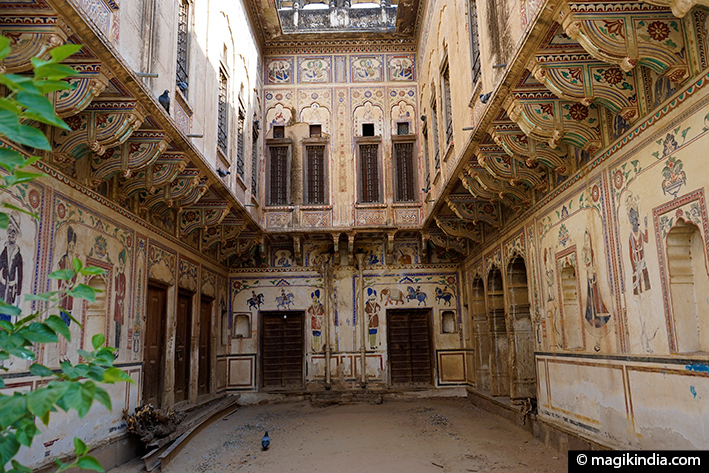 Nawalgarh, the Shekhawati region’s main town, has many havelis in various states of repair. 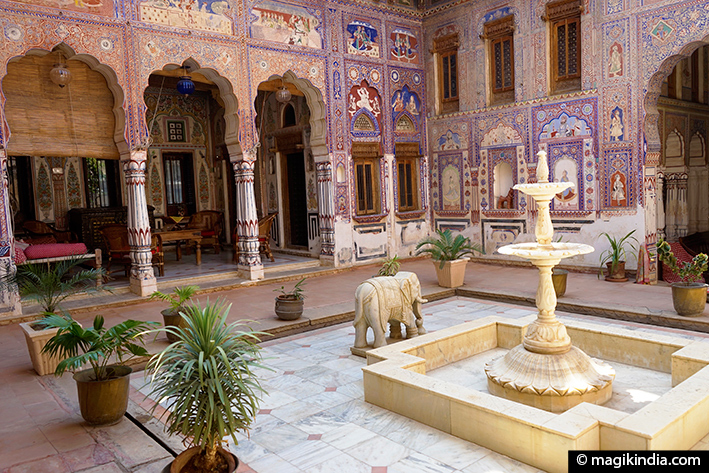 The must-see among them is the Dr Ramnath A. Podar Haveli Museum. Built around 1902 by Anandilal Podar, this mansion boasts more than 750 hundred-year-old frescoes. It was converted into a museum by Kantikumar R. Podar, grandson of Anandilal B. Podar, to create a cultural centre showing Rajasthan’s heritage and promote tourism in the region. 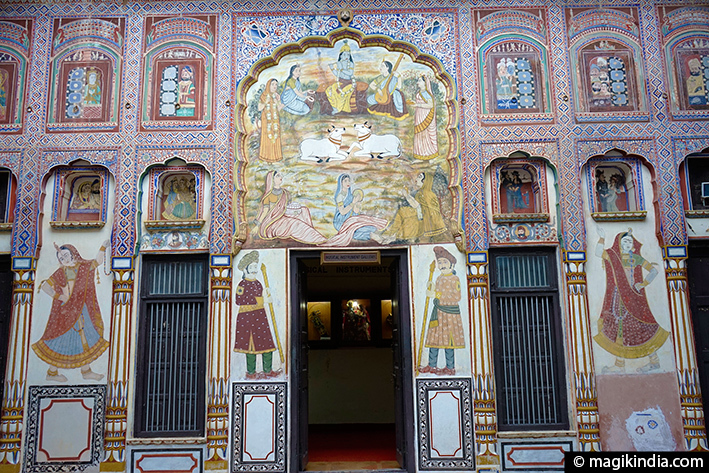 Jhunjhunu’s main attraction is the Rani Sati temple. Rani Sati or Dadiji (grandmother) was a Rajasthani who lived sometime between the 13th and 17th centuries and performed sati, sacrificing herself on her husband’s funeral pyre. 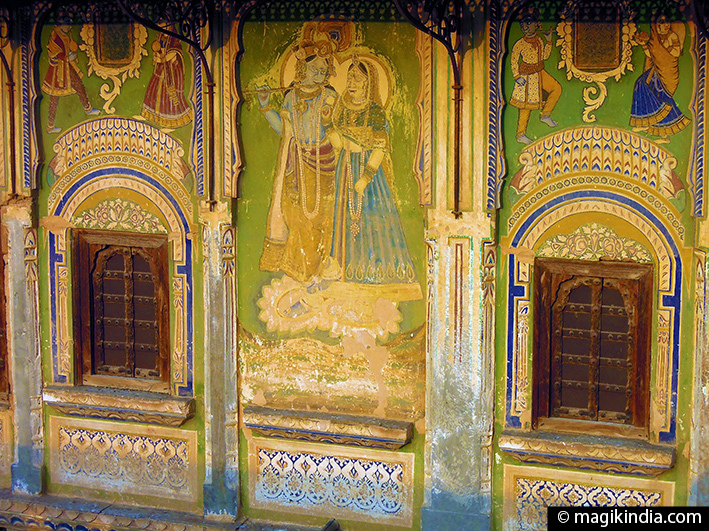 Several temples in Rajasthan are dedicated to her memory. 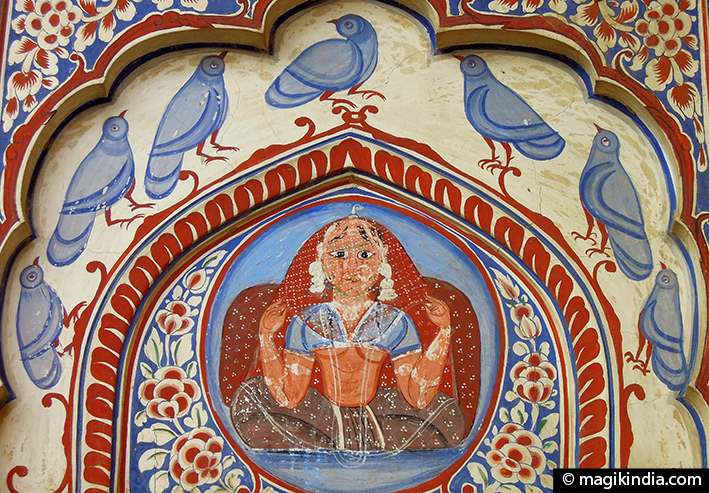 Mandawa, the most popular town in Shekhawati for tourists, was founded in the 18th century. This is where most travellers set down their bags. It also has a host of havelis to visit, including the splendid Chokhani double haveli, so called because it consists of two distinct but adjoining wings. 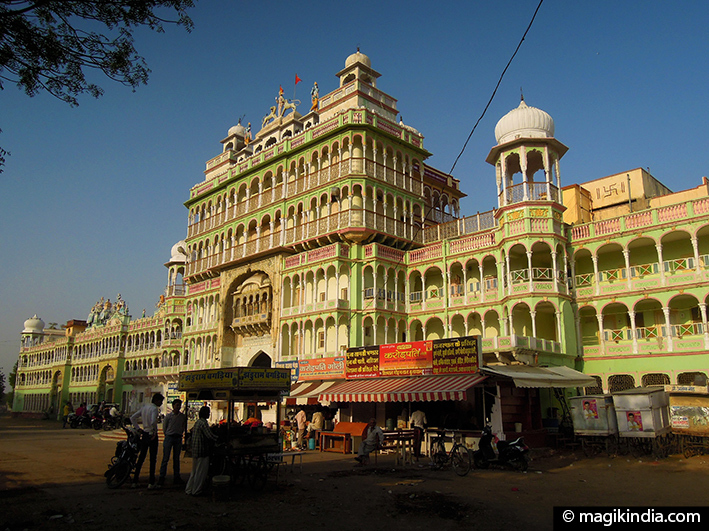 It was built in the 19th century by the Chokhanis, who were prosperous Mandawa merchants. The village of Dundlod has several beautiful mansions. The Goenka haveli is a stunning example. It has been marvellously renovated and converted into a museum presenting tableaus of the everyday life of the Marwari merchant class of old. In this small village way out in the countryside you’ll find a prestigious haveli called Sona Chand Ki Dukan or “house of silver and gold”. It was built in 1850 by Sej Ram Poddar, a wealthy jeweller. The flower patterns in the frescoes in the gilt room are of breathtaking finesse. 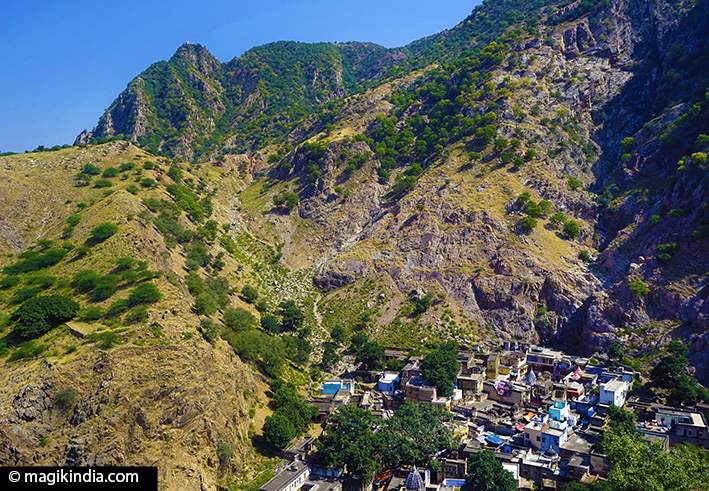 Lohargal, 68km from Jhunjhunu and 10km from Udaipurwat, is a gem hidden away among ancient mango trees and banyans in the Aravalli hills. It is a pilgrimage centre with a temple to Surya the sun god. Pilgrims flock to the sacred bathing tank here. According to legend, Bhima, one of the heroes of the great Mahabharata epic, came to bathe here with his Pandava army after winning the battle of Kurukshetra. The entire army plunged into the pool to wash themselves of their crimes and wash the blood from their weapons. All the weapons dissolved in the water and ever since this miracle the place has been called Lohargal: “that which melts iron”. 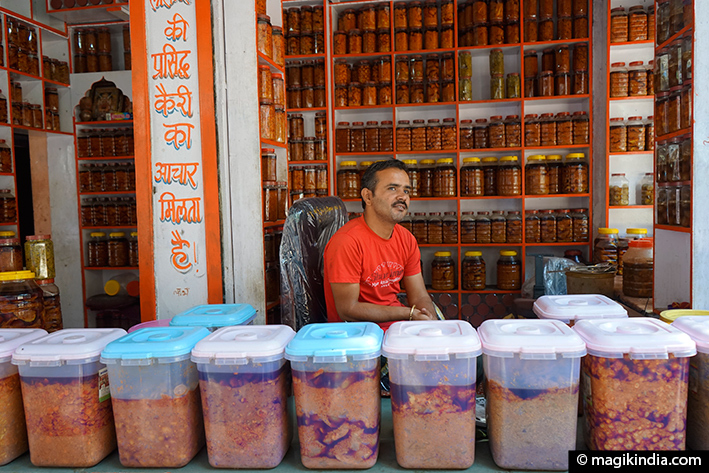 Lohargal is also known for its achaar (spicy pickles), especially its green mango one. Kiroriji, near Lohargal, is another pilgrimage place. 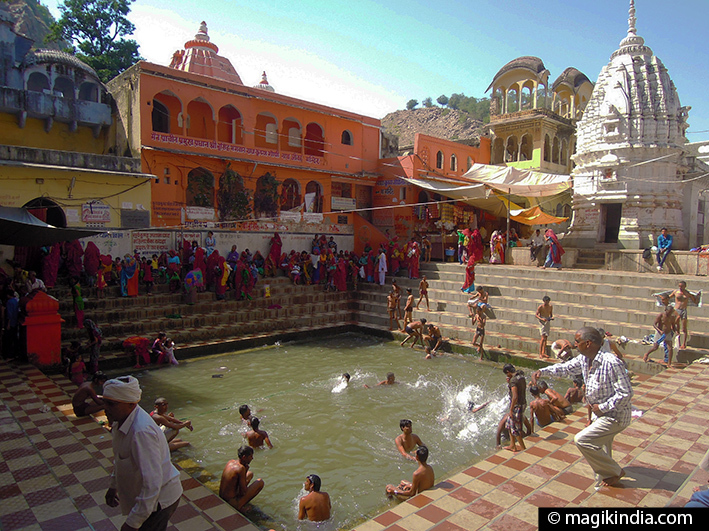 It is famous for its two spring-water pools, one hot and one cold. 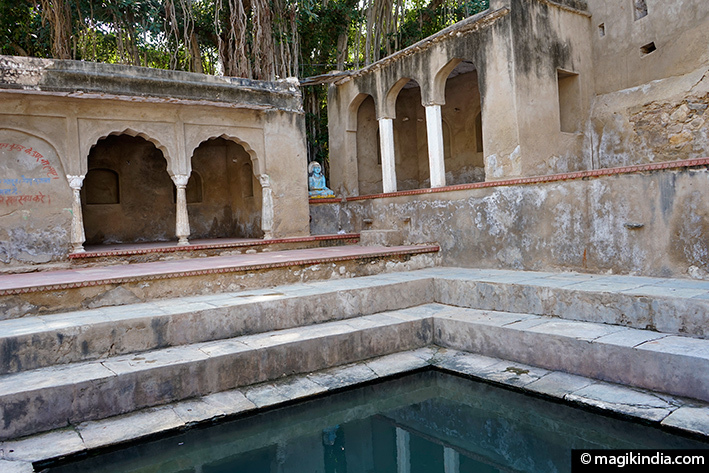 The Pandavas from the Mahabaratha epic are said to have bathed here too. The 74km parikrama (circumambulation) round the hills that takes place every August starts and ends here.